Columbine High School. Red Lake Senior High School. Nickel Mines Schoolhouse. Sandy Hook Elementary School. Marshall County High School. And most recently, Marjory Stoneman Douglas High School in Parkland, Florida. It’s tragic to hear of students and faculty losing their lives over senseless acts of violence. Unfortunately, there’s not a solution to end the violence in our world and in our schools. That said, you cannot underestimate the power of preparation. While you can’t keep a shooter from making violent choices, you can try to keep the shooter out of your classroom. While you can’t offer emergency surgery for victims, you can try to stop the bleeding until first responders arrive. You hope an intrusion will never happen at your school. But if it does, are you prepared? Below, you’ll find a couple of products that can help you help your students in an active shooter situation. The Barracuda™ Intruder Defense System is designed to protect students and faculty against building intruders in emergency situations. The system securely locks an entry point in a lock-down situation, and can be installed in a matter of seconds. Learn more about the Barracuda Intruder Defense System. Up-to-date pricing is always available on schoolkidshealthcare.com. If you are buying in bulk for an entire school or district, please call 866.558.0686 or email service@schoolkidshealthcare.com for special pricing. The International Fire Code does contain language that prohibits locks/latches that cannot be opened from the hall side. That said, logic and good sense suggest that the benefits of a device like the Barracuda far outweigh the risks. Bilco, the manufacturer of the Barracuda, has found that local authorities having jurisdiction understand the importance of securing doors during lock-down situations, and have allowed them for this specific need. If you’re concerned, we recommend discussing with your local fire marshal. A person who is bleeding can die from blood loss within five minutes1. It may take longer than five minutes for first responders to arrive – especially in an active-shooter environment that is deemed unsafe. If teachers, administration and even students have the tools and knowledge to help stop the bleeding, they have potential to save a life. 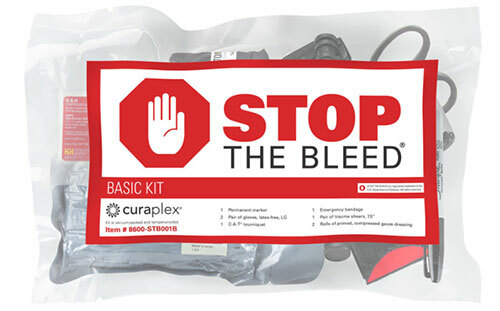 Bleeding control is so important that the White House and National Security Council jointly launched a national Stop the Bleed campaign in October of 2015. Stop the Bleed is intended to cultivate grassroots efforts that encourage bystanders to become trained, equipped and empowered to help in a bleeding emergency before professional help arrives. Having tools and products is one part of preparation, but adequate planning is even more important. We encourage you to work with your school administration, local law enforcement and local fire department to create policies and procedures, should you ever be faced with an active-shooter or other emergency scenario. The National Association of School Nurses (NASN) 47th Annual Conference is upon us! It’s hard to believe a year has gone by already. This year’s conference is in none other than the City of Brotherly Love – Philadelphia. The NASN annual conference gives school nurses a chance to come together, share stories, challenges, and accomplishments. On top of that, the top notch educational sessions offered provide not only great takeaways, but validation of personal contributions. School Kids Healthcare is excited to attend the NASN 47th Annual Conference. Please stop and visit Kim at booth 612 and pick up a special flyer about our NEW Online Loyalty Rewards Program as well as a special promo code. Thanks again for all you do and here’s to a great conference! The 2015 School Kids Healthcare Catalog Is Here! Also look for new callouts throughout the School Kids Healthcare catalog to quickly find Online Loyalty brands. With the School Kids Healthcare Online Loyalty Rewards Program you will earn points on your online purchase of select loyalty branded products at published list prices. You may then redeem your points on future online purchases. It’s as easy as 1, 2, 3! Sign up today and receive 500 FREE Loyalty Points! To learn more about the School Kids Healthcare Online Loyalty Rewards Program please see our FAQs and Terms and Conditions.